Charline Tyberghein (1993, Antwerp) graduated from the Royal Academy of Fine Arts Antwerp in 2018 and has very quickly developed a strong, incomparable aesthetic that has managed to stay on many people’s retina and mind. She works and lives in Antwerp. In Tyberghein’s we find highly simplified objects reduced to symbols and pictograms which are then inflated to reach a maximum potential of readability. This readability is very ambiguous. Banal objects and universalized, impersonal symbols, typically enabling a straightforward interpretation, are claimed as the artist’s own to translate her most personal experiences, turning them into in a new, parallel language. The symbols become the characters in a seemingly impenetrable story. Some of these symbols are repeated over and over while their meaning morph throughout the different stories showing us that above all context and interrelationship seem to be the key narrators. We are left wondering what is (not) told but aren’t provided with a legend and we can only dream up our own stories as our imagination quickly takes off. At first glance the images are flat, very flat but they also play with depth in a very selective and demonstrative way, often through trompe l’oeil techniques. The layers of meaning and connotation however provide the most perspective and so the visible and the perceived take on a new dialectic relationship. Tyberghein’s works are characterised by a calm, calculated approach. There’s no trace of expressive or explosive energies. “Once I start to paint, I know almost perfectly what the painting will look like.” This patient, orderly way of painting acts as a counter weight to life’s chaos. In a therapeutic manner she builds up her work through repetition, layers and patterns. She does allow for errors however, as they enliven the paintings even more. Tyberghein purposely leaves room for multiple imaginations but doesn’t leave it at that and plays an inviting game with the audience through her articulate and subtle but mesmerising use of colours and implicit sense of humour. 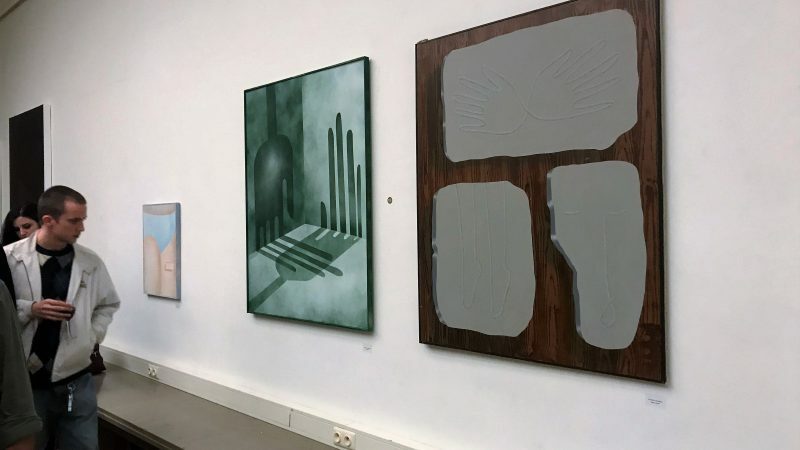 Charline Tyberghein won the KoMASK award for best young European painter at the European Masters Salon Painting 2018 at the Royal Academy of Fine Arts Antwerp.